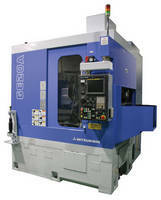 Tokyo – Mitsubishi Heavy Industries, Ltd. (MHI) will exhibit one of its best-selling gear hobbing machine at "FEIMAFE 2013," the 14th International Machine Tools and Integrated Manufacturing Systems Trade Fair to be held in Sao Paulo, Brazil, for six days from June 3 through 8. The MHI exhibit will feature a live demonstration of gear cutting by a fully "dry-cut" gear hobbing machine that does not require the use of any cutting oil. With its exhibit, MHI aims to promote its machine tools in the Brazilian market, which is the largest in South America, and to expand its gear cutting machine sales, particularly in the country's rapidly growing automobile and industrial machinery manufacturing industries. The GE20A hobbing machine to be demonstrated at FEIMAFE 2013 is the best-selling unit in the GE Series, the world's first complete dry-cut gear hobbing machines that MHI introduced in 2003. The machine is capable of high-speed, high-accuracy machining of gears up to 200mm in diameter that are frequently used for automobile transmission systems. As the dry-cut system produces no oil mist or waste oil in the machining process, it helps to improve both the working environment and machine maintainability. By showing the GE20A in action, MHI will demonstrate these advantages as well as the unit's superior energy savings and economical operation. In addition to live demonstrations of GE20A machining, the MHI exhibit will also feature panel displays of other large-size machine tools offered by the company. FEIMAFE is held every other year and is the largest machine tool fair in Brazil. The previous fair, held in 2011, featured more than 1,300 exhibitors and was attended by more than 70,000 visitors. MHI sells and services machine tools in Brazil through Mitsubishi Industrias Pesadas do Brasil Ltda., which was established in Sao Paulo in 2005. Although MHI faces stiff competition from U.S. and European machine tool manufacturers in Brazil and other South American markets due to geographical and other factors, it will take advantage of FEIMAFE 2013 to promote understanding and recognition of MHI products through direct communication with potential customers and live demonstrations. Automobile sales in Brazil are growing, and since 2010, it has ranked fourth in automobile unit sales globally. The country's government has also adopted policies to help upgrade the domestic auto industry and increase automobile production, resulting in increased demand for transmission system gears and other gears. In addition, the country is also slated to host the 2014 FIFA World Cup and 2016 Summer Olympic Games, both of which are expected to contribute to continued economic growth. MHI will continue to focus on expanding its customer base in Brazil, particularly with respect to gear machines, and establish a solid foothold that will enable it to explore business opportunities in other South American markets in the future.